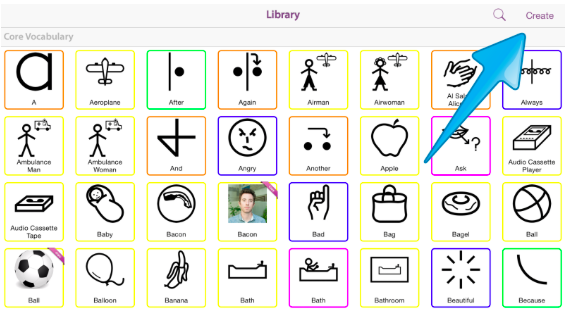 One of the best things about MyChoicePad is that you can add your own photos, pictures and audio to make learning more personalised, more effective and more fun! The best place to start this guide to customisation in MyChoicePad is by looking at existing Concepts. This will ease you in to customisation before you start creating new concepts yourself! Any of the concepts in the Library can be customised. To do so you will need to make a copy of the concept first. 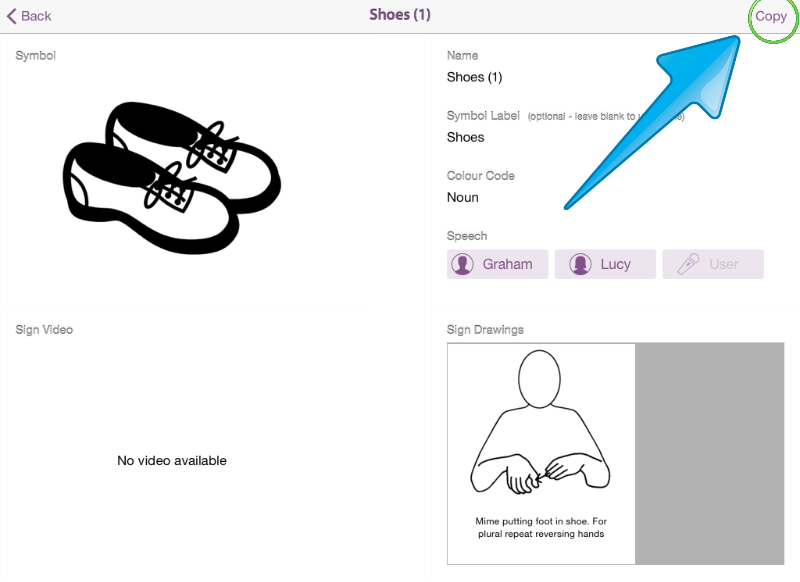 This way you will always have the original Makaton concept available too. You will be able to make as many customised copies of a concept as you like. To customise an existing concept, simply open the Library and tap on the concept that you would like to customise. This will bring you to the concept details screen. Then tap on the "copy" button on the top right of the screen in order to enter edit mode. Once you're in edit mode on the concept details screen, you can change the image used for the concept by tapping on the current symbol. This will bring up the option to select a picture from your iPad library or take your own photo using the iPad's built in camera. To the right of the page is the option to change the speech from a male voice (Graham) to a female voice (Lucy). You can also record your own voice by tapping on the "User +" button. This will open up a voice recorder. Simply press "Record" to start recording and "Stop" when you're done. In this example, I've replaced the symbol for "Shoes" with a photo of my shoes, using the iPad's built in camera. I've also recorded my own voice to replace the pre-recorded voice! Can I change it back?! Yes! Don't worry, it's easy to undo any changes you make. To change the audio back, simply re-choose Graham or Lucy. 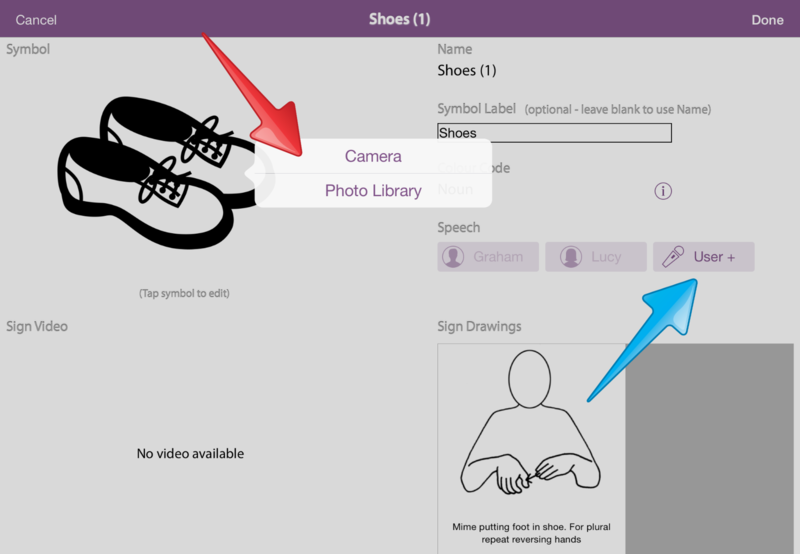 To get back to the original Makaton symbol, simply delete the picture you inserted by tapping on it and selecting "Delete Image". As you will see, this means the symbol reverts back to the original Makaton Symbol. The good news is that the process for creating a new concept is very similar to the way you customise an existing one! A new Concept can be created from the Library screen. This can be accessed from the "My Grids" screen or from within a Grid (in edit mode) by clicking on the "add" icon to add a new concept. When you are in the Library screen, you can create a new concept by tapping on the "create" icon. This will bring up the New Concept screen which should look familiar because it is the same as the Concept Detail screen! Working in exactly the same way as when we customised a concept, you can set the Concept image and voice for you new Concept. The only additional steps are to add a name for your new concept and optionally set the correct colour code by defining whether your Concept is a Noun, Verb etc. And that's it, you can now make your own concepts!